Only one starfish is known for eating coral, and that's the Acanthaster planti, commonly known as the crown of thorns (COT) starfish. They range in size from tiny aquarium specimens to as large as 30 inches in diameter. Unlike the typical five-armed starfish, COT starfish can have as many as 21 arms, all covered in sharp spines. 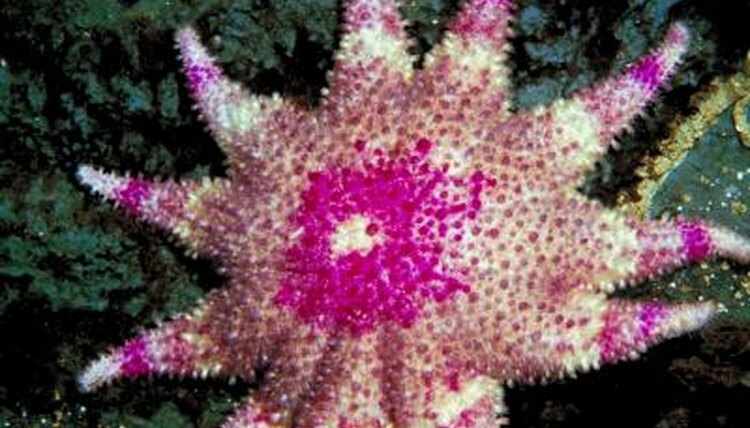 Indian Ocean COT starfish are usually grayish green with areas of light red, while COT starfish from southeast Asia can be bright blue or purple. Scientists believe COT starfish have lived in the world's reefs, in the Indian and Pacific oceans, for thousands of years. Colonies are found off the coasts of Malaysia, the Philippines, Papua New Guinea, the Solomon Islands, Australia and Hawaii. Normally they play a valuable part in the reef's ecosystem by eating the faster-growing corals, providing space for the slower-growing corals to flourish. Aquarium owners often encounter them as stowaways on coral they purchase for the tank. These starfish attach their tubular feet to the coral, extend their stomachs out through their mouths, and excrete digestive juices over the coral's soft tissue polyps. This liquefies the tissue so the crown of thorns can absorb it. They often hide in crevices during the day and come out to eat at night; aquarium owners with tiny species may not know they have crown of thorns until their coral begins to be eaten. Crown of thorns in the oceans follow the same nocturnal feeding patterns unless many live in one area, in which case they feed continuously, night and day, as they compete for food. Just as a few crown of thorns in a home tank can eat the live coral, leaving behind just a skeleton, those in the ocean can kill an entire area of coral. This occurs when too many COT starfish inhabit one area and eat coral faster than it can grow. The resulting reduction in coral hurts the ecosystem by promoting algae growth, which harms the thousands of fish species that live in the reef. Population outbreaks have become more common. A single crown of thorns starfish can produce 100 million eggs in one year, and a former theory was that eggs migrated downstream to other areas, causing what scientists called a secondary outbreak. By genetically testing specimens off the coast of Hawaii, however, researchers from the University of Hawaii and Rutgers University found that Hawaii's crown of thorns were not related to those in other areas. Since outbreaks tend to follow flooding or other severe weather, scientists concluded that runoff from fertilizers and pesticides could be to blame for the increasing number of population outbreaks. These substances promote the growth of the phytoplankton eaten by COT larvae, thus allowing large numbers of them to survive. While home aquarium users can pick off the offending starfish, or introduce harlequin shrimp that feed on them, this isn't feasible in the oceans. Scientists from the Arc Centre of Excellence for Coral Reef Studies at James Cook University in Australia found that a protein mixture normally used in the lab to grow Vibrio bacteria—which live naturally in crown of thorns—can kill them when injected in larger concentrations. The bacteria also spreads to other crown of thorns nearby, killing up to 500 with one dose. This could be useful to control one tourist area's reefs, scientists say, but not on a large scale. Teams are also considering introducing natural parasites and organisms that cause diseases. What Role Do Parrotfish Play in Reef Ecosystems? What Do Wild Discus Eat?